Since the early days of man, hunting was a means of survival. As civilization advanced, harvesting animals for food has become a novelty. Recent decades have provided insight to our detrimental effects on our surroundings as our human population expands. Current whaling practices prove inhumane and unnecessary to sustain man’s appetite. Scientific studies on our ocean’s declining great whales have lead to concern for the well being and maintenance of these species. New scientific data has shown that the harvesting of whales is completely unsustainable today, due to major overexploitation. Current management of international whaling has come under scrutiny in recent years, due to the divide between pro and anti whaling nations. Pro-whaling nations, such as Japan, continue to view whales as a food resource and use whaling as a political tool to maintain other fisheries around the world. I'd like to reflect on the history of whaling and the current management framework relied on today. The economic benefits are superseded, but not outweighed, by the shift from whaling to whale watching, as has been illustrated by other countries. There is a great need for a normalization of the International Whaling Commission to suit current scientific knowledge of these gentle giants. Future recommendations need to reflect the shift in traditional, cultural practices to accommodate current conservation values. To maintain a healthy environment, with which we rely on, preserving biodiversity is essential to the health and survival of humans and our planet. Whaling refers to the hunting of whales which dates back to 3,000 BC (Britannica, retrieved 2013). The traditional Arctic whaling developed in the seventeenth century with organized fleets, and by the eighteenth and nineteenth centuries it had evolved into a competitive international industry. In the twentieth century, factory ships were introduced along with the concept of whale “harvesting,” and by the late nineteen-thirties, more than fifty thousand whales were killed annually (Wikipedia, 2009a). The depletion of cetacean species over centuries of overexploitation precipitated attempts to institute regulations for the whaling industry by setting catch limits in the twentieth century. In 1931, the Convention for the Regulation of Whaling was signed in Geneva in an effort to control the Antarctic whale fishery ("Convention For The Regulation of Whaling," 1935; Gambell, 1993). In 1937, nine nations signed a new international agreement for the regulation of whaling, as the 1931 convention was failing to be functionally useful. This new agreement protected depleted stocks, forbidding the capture of females accompanied by calves, restricted the pelagic whaling season in the Antarctic to three months and regulated broad areas of the world’s oceans by closing north of 40”s to factory ship operations. This agreement went further by requiring governments to record statistics of vessels, catches, biological data on the whales, and quantities of products obtained (Gambell, 1993). Known as the 1938 Protocol, a whale sanctuary between longitudes 70” W and 160”W in the Antarctic, as well as a ban on humpback whales in Antarctic, were designated that year (Gambell, 1993). The following protocols in 1944 and 1945 set an overall catch limit in the Antarctic region (Gambell, 1993). 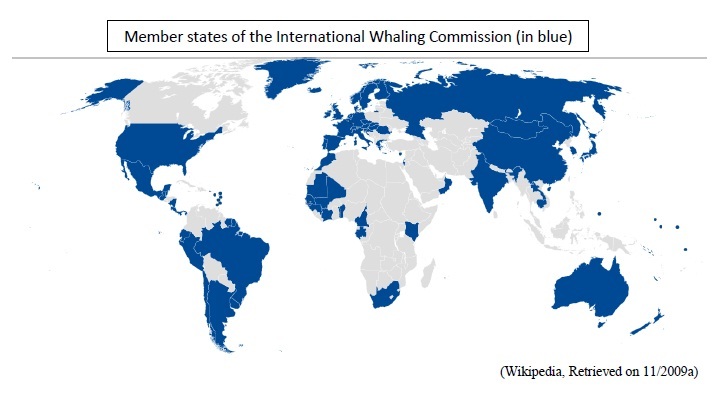 In 1946, fifteen nations came together with a common interest in preserving and maintaining the global population of whale stocks by creating the International Whaling Commission (IWC) (Smith, G. 1984). Not all countries joined the International Whaling Commission out of desire to conserve whales, but to preserve their own commercial interests in whaling. In 1975, the International Whaling Commission accepted its “new management procedure” for commercial whaling, which established a management scheme based on a systems analysis program of maximum sustainable yield (MSY) designed to regulate catches on an individual basis, rather than by a blanket action (Gambell, 1993). During this same time the development of aboriginal hunting was also established. In 1982, the International Whaling commission took a precautionary approach and adopted a moratorium on commercial whaling (Gambell, 1993). The use of the precautionary principle represented a new approach to managing uncertainty (Heazle, 2006) and the International Whaling Commissions adoption of a moratorium on commercial whaling points to a major turning point in dealing with scientific uncertainty. This approach set the stage for the welfare of the environment in dominating the commissions policy (Heazle, 2006). As whale stocks in every ocean in the world have been reduced to a fraction of their original population sizes, the International Whaling Commission is under global scrutiny and pressure from both conservationists and pro-whaling countries (Smith, G. 1984). Contemporary arguments for and against whaling are the subject of ongoing discussion and conservation groups argue commercial whaling, which is banned under the International Whaling Commission, still occurs under the guise of scientific research (Wikipedia, 2009b). Under current regulations of the International Whaling Commission, members whale under three general exemptions: aboriginal whaling, scientific permits, and whaling under objection (Miller, 2007). Questions regarding the validity and value of scientific research by International Whaling Commission members and the scientific community have arisen. ‘While scientific whaling has not been outlawed, the International Whaling Commission passed resolutions in 2000, 2001, and 2005 urging Japan to withdraw its proposal for scientific whaling’ (Miller, 2007). The delicate legal regime of the International Whaling Commission faces serious challenges to continued collaboration between invested parties. Countries, such as Norway and Iceland, that still participate in commercial whaling have openly objected to the International Whaling Commission’s policy of zero-take on commercial whaling, and so are not held to it, as participation in the IWC is voluntary. ‘In April 1992, the North Atlantic Marine Mammal Commission (NAMMCO) was established by the Faroe Islands, Greenland, Iceland and Norway’(Eiriksson, 1992), which allows a so-called, harvesting of a “sustainable quota of marine mammals”. The North Atlantic Marine mammal Commission was established in part out of dissatisfaction with the IWC's zero-take quota (Eiriksson, 1992) and has challenged the legitimacy of the International Whaling Commission. Japan has threatened to leave the IWC, like Greenland, and join NAMMCO, should the moratorium on whale hunting not be lifted. The issue here ‘is not that some whales are not abundant, but that the whaling industry cannot be trusted to regulate itself or to honestly assess the status of potentially exploitable populations’ (P. J. Clapham, et al, 2007). This impression originates from a long history of illegal, unlawful, and unreported takes by the Soviet Union and the current conduct of Japan today. It has been discovered, through recently released records of old Soviet whaling ships, that approximately forty-six thousand whales were slaughtered illegally in the Southern Ocean and never reported to the International Whaling Commission, between the years of 1947 and 1973 (P. Clapham, et al, 2008, 2009). Today, Japan’s inadequate science, implausible stock assessments, insistence to cull marine mammals as an appropriate form of management, and the fabrication of whaling and fisheries catch data (P. J. Clapham, et al, 2007) exemplify why the whaling industry cannot be trusted in regulating itself. Under the guise of scientific whaling, Japan has killed close to ten thousand whales, four times the amount killed for research by all other nations combined since 1952 (P. J. Clapham, et al, 2007). Japan’s interest in whaling is part of a larger picture involving a perceived right to hold boundless access to worldwide marine resources; thus, concessions made in regard to the International Whaling Commission could have potentially serious consequences in other arenas (P. J. Clapham, et al, 2007). In the 1950’s the first whale watching company was founded off the coast of California. Today whale watching has grown into a $USD 2.1 billion per year industry occurring in 119 countries where more than thirteen million people took tours during 2008 (O'Conner, 2009). Whale watching has even developed in countries that still hunt whales, such as Japan, Norway, and Iceland (Hoyt, 2001). The development of whale watching, in the last sixty years, has increased the magnitude of stakeholders in regard to the future of the International Whaling Commission. In 1946, the International Convention for the Regulation of Whaling was signed by fifteen countries; Argentina, Australia, Brazil, Canada, Chile, Denmark, France, the Netherlands, New Zealand, Norway, Peru, the Union of Soviet Socialist Republics, the United Kingdom, the Union of South Africa and The United States (IWC, 2013). Today, there are nearly ninety members (IWC, 2013). Given the highly migratory nature of cetaceans, their removal from an area can dramatically affect another. Such as in the case of Southern Hemisphere Humpback Whales which feed in Antarctic waters and migrate north to breeding and calving grounds. At the beginning of the twentieth century, southern humpback whale numbers were thought to have been one-hundred twenty thousand. This estimate is conservative considering one-hundred sixty thousand were reportedly killed from 1900-1963 and then additional forty-six thousand that were illegally slaughtered by Soviet Union whaling ships between the years of 1947 and 1973 (P. Clapham, et al, 2009; Eyre, 2009). This assault on the humpback whale populations precipitated the closure of shore whaling stations in Australia and New Zealand in the early 1960’s (P. Clapham, et al, 2008) and many of the whales killed are thought to have been from Oceania populations, such as Tonga (Eyre, 2009). In the Kingdom of Tonga, the humpback whale population has shown little recovery from whaling, even though the east coast of Australia population has exhibited a noticeable increase (Noad, 2008). This might be caused by several factors, including the possibility that the individuals killed for research in the Southern Ocean by the Japanese are part of the Tongan population of humpbacks, although this is just speculation. Tonga is not a member of the International Whaling Commission, but is affected by the actions taken by it and, therefore, is one of the many stakeholders in regard to the issue of international whaling. Each year, the Japanese scientific research permits, through the International Whaling Commission, give allowances to take these whales. The loss of Humpback whales in the Southern Ocean can accumulate to lost dollars in whale watching countries, such as Tonga, that rely on the population to return to breeding and calving grounds. Also, disruption of equilibrium of marine communities will inevitably result in degradation of lower trophic level species from the removal of whales. It has been suggested that people and whales prosper more when these gentle giants are seen and not hurt (Hoyt, 2001). In fact, the growth of the whale watching industry is so great that over that last ten years, it has left behind global tourism growth rates, creating thousands of businesses and jobs around the world, more than three thousand operations globally that employ more that thirteen thousand individuals (O'Conner, 2009). The International Fund for Animal Welfare (IFAW) reported more than 13 million people took whale watching tours in 2008 (O'Conner, 2009), increasing the number of stakeholders, to not only whale watching operators and workers, but to the individuals whose livelihoods depends on the ability to study, film, and photograph cetaceans. Not included here, and often overlooked, are the individuals who find intrinsic value and joy in seeing cetaceans in their natural habitat; to some extent they also have a stake in the future of whales. The standing moratorium on whaling is then seen to secure and protect a significant amount of some countries Gross Domestic Product (GDP), livelihoods of whale-watch operators, workers, researchers, and wildlife photographers. As countries, such as Japan, Norway, and Iceland, hold firmly to their right to hunt endangered cetacean populations, it is clear that Cartesian ideals still remain today, pinning nature against man; nature on one side and culture on the other; nature is winning or man is winning. Murray Bookchin, a pioneer in the ecology movement who was against exploiting the natural world as a resource to be dominated, once said ‘the plundering of the human spirit by the market place is paralleled by the plundering of the earth by capital’ (Bookchin, 1971 & 2004). By this standard, as the future of whaling is debated by governments, it is increasingly clear that whale watching is the most sustainable, environmentally-friendly and economically beneficial ‘use’ of whales today (O'Conner, 2009). 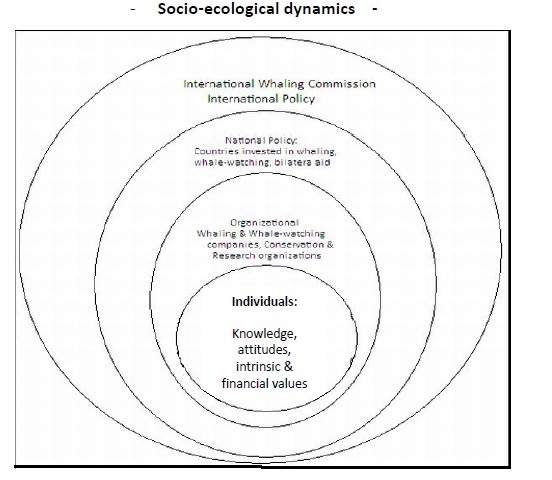 The International Whaling Commission has developed management procedures that deal with uncertainty that identifies trade-offs among management objectives and assess outcomes of alternative actions(A. D. E. Smith, et. al., 1999). 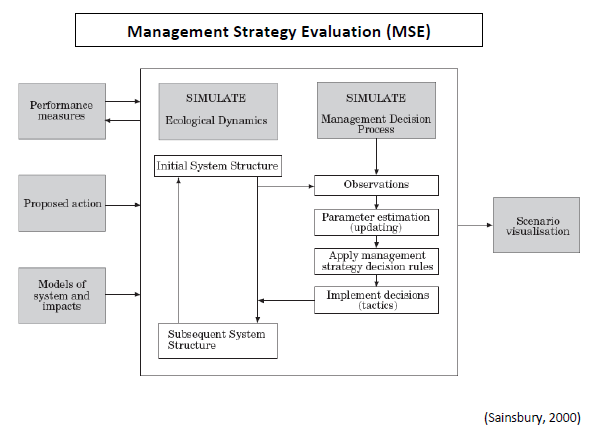 The framework of management strategy evaluations (MSE) is adaptive in design and attempts to manage uncertain action like those of dynamic ecosystem processes such as food chain interactions and dependencies(Sainsbury, 2000). Previous methods by the International Whaling Commission for setting catch limits through maximum sustainable yields (MSY) proved to be a failure in that they inadequately estimated key parameters (Sainsbury, 2000). The International Convention for the Regulations of Whaling states, in Article III, that it was established to carry out ‘proper conservation of whale stocks and thus make possible the orderly development of the whaling industry’ (IWC, 1946). The shift over the years from pro-whaling to a moratorium on whaling has fractured the International Whaling Commission into two separate opposing sides. Exaggerating the debate and further polarizing the International Whaling Commission is the inability of anti-whalers to accede the concern for the principle of food security and the pro-whalers to recognize that the ‘anti-whaling case rests as much on animal rights issues as it does on stock sustainability’ (Iliff, 2008b). Stakeholders are no longer just those interested in whaling for subsistence but those with vested interest in other fisheries around the world, like Japan, as well as the countries whose whale watching industry has grown to influence their economy. The International Whaling Commission has become a battleground, ineffective for either position, and often ignoring other threats to cetaceans around the world such as pollution, vessel strikes, marine debris, and climate change (Black, 2008). Additionally overlooked by pro-whalers is the amount of toxins found in whale meat and the health risk it presents to the public (Simmonds, 2002). One management arrangement attempts to secure votes in the International Whaling Commission, by recruiting in and employing bilateral aid to encourage developing countries to support one side of the agenda over the other (Miller, 2007). In 2006, a return of the majority position to anti-whalers of the International Whaling Commission caused yet another threat from Japan to withdraw from the Convention (Iliff, 2008b). This threat poses both positive and negative feedback loops for both sides. Firstly, if Japan does withdraw it would release them from obligation to comply with the Convention and allow anti-whaling groups to change the International Whaling Commission and International Convention for the Regulations of Whaling toward a more conservation minded organization (Iliff, 2008b). Alternatively, depending on what members followed Japan’s lead, it would test the legitimacy of the International Whaling Commission and lose the ability to control global whaling activities of pro-whaling nations (Iliff, 2008b). Since the 1980s, the growth of both pro and anti whaling members in the International Whaling Commission demonstrates the struggle to attain votes in order to gain control and power of the commission (Iliff, 2008a). Though, in the last ten years, very little has been accomplished to resolve the debate between whaling and whale conservation. Countries such as Norway, Iceland, Greenland, and the Faroe Islands have opted out of the International Whaling Commission to facilitate their own whaling customs, leaving Japan as the last remaining major pro-whaling nation. The Japanese word for whale is “Brave Fish” pronounced “ISANA", so closely are whales tied to their fisheries. Though, public opinion in Japan does not support whale meat consumption (Miller, 2007), there are two major arguments for Japans insistence to continued whaling. Firstly, if Japan submits to an injunction from the international community, like that from the International Whaling Commission, to desist in harvesting of one marine resource, it may set a precedent for submitting to future injunctions in other fisheries (Iliff, 2008a). Secondly, as fish stocks decrease globally due to overexploitation, Japanese Fisheries Agency can blame whales for the cause and thus absconding responsibility themselves (Iliff, 2008a). Much attention is paid to Japan, as it plays a pivotal role in this two sided controversy as the archetype for all whaling nations and, thus, brings legitimacy to the International Whaling Commission. By continuing to follow the Conventions rules, under scientific permits, Japan is able to continue their annual whale hunts while still working within the framework; creating one of the few positive feedback loops in this management system. In this way both pro- and anti-whaling sides are getting what they want, for the moment. The International Whaling Commission is not a major political, economic, or environmental regime in today’s modern times (Miller, 2007). Neither is whaling a very large portion of Japans economy. In fact, as Japanese government spending is under review and wasteful programs look to be cut, the whaling industry could be coming to an end (Greenpeace, 2009). The Japanese government has been subsidizing whaling in the Southern Ocean for years, though little profit is seen from it (Graef, 2013). Identifying and promoting solutions to the issues surrounding the controversy of international whaling is a difficult task. The main cause for concern for whaling countries is food resources and scarcity. Finding a way to assure food availability in other areas, other than whale meat, in food cultures built around fisheries will then become a necessity in negotiating a way forward. The past deputy whaling commissioner for Japan, Joji Morishita, has stated ‘Japan’s fisheries can’t be protected without whaling’ (P. J. Clapham, et al, 2007). Assuring nations, such as Japan, of their fisheries rights and collaborating in global sustainable fishing will also be necessary. While governments debate over the validity of whaling and fisheries rights, global fishery stocks are collapsing from over-exploitation, increased pollutants are making their way to people’s dinner table, and species are going extinct. This realization is imperative in order to change our attitudes and behavior toward the natural world. A shift in old approaches to food cultures needs to give way in order to pave the way for new cultural paradigms. If this choice is not made soon voluntarily, it will be made later out of necessity. Food scarcity will continue to be of major concern with the exponential demand of overexploited resources.